School is back in session for a lot of kids around the valley. With the ever growing list of school supplies needed, some valley families could use a little help. 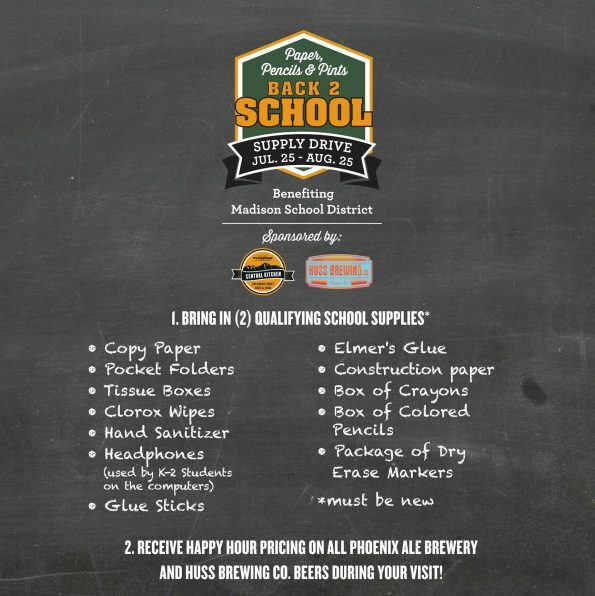 The Phoenix Ale Brewery Central Kitchen (Central Kitchen), Central Phoenix’s newest gastropub, and Huss Brewing Co. are partnering for a back-to-school drive benefiting the Madison School District from July 25th until August 25th. Central Kitchen has a donation box inside its restaurant for dropping-off much-needed school supplies. Guests are to notify their server about their donation to redeem the offer at the time of the visit. To culminate the program, Central Kitchen and Huss Brewing Co. will be hosting an exclusive event on Aug. 25 from 6:30-8:30 p.m. The ticketed dinner will feature exclusive menu items prepared with Huss beers. Tickets and more details on the special event will be available soon at centralkitchenaz.com. The restaurant is located at 5813 N. 7th St. in Phoenix (next to Okra) and will be open 11 a.m.- 10 p.m. Sunday through Thursday, and 11 a.m. – 11 p.m. on Friday and Saturday. “Craft To-Go” (carryout) ordering, and crowler and growler refills are also available. 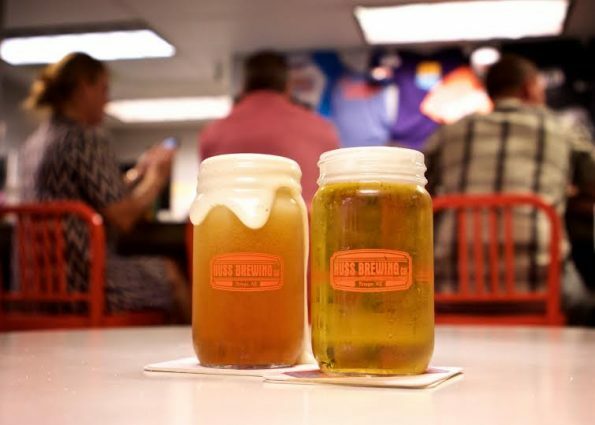 The Phoenix Ale Brewery Central Kitchen is the first restaurant collaboration between one of Arizona’s most beloved breweries, The Phoenix Ale Brewery, and Rich Stark, formerly CEO of NYPD Pizza. Founded in 2016, the gastropub is a celebration of craft beer and craft food, which is more than just a slogan. It is the restaurant’s commitment to serve The Phoenix Ale Brewery’s top-notch local brews and pair them with one-of-a-kind dishes that make guests wonder why they ever settled for traditional pub fare. On the menu, patrons will find everything from new spins on pub classics, such as pretzel bites and wings, to salads, sandwiches, burgers, hearty comfort food entrees, the signature Black Iron Pizzas, and even a beer-infused dessert. The restaurant offers a robust menu of beers, with 16 brews on tap at all times. At Central Kitchen, there is something for everyone – even “Half Pints” (children) – and the patio is dog friendly. Central Kitchen is located in Uptown Phoenix at 5813 N. 7th St. For more information, please visit centralkitchenaz.com or call (602)313-8713.